A large maple tree, the focal point of the front yard of my home based business, died two years ago and my family had to decide what to do with it. Cutting it down was a worst case scenario, as it would leave a huge gap in my front yard that would take decades to fill with any kind of replacement, so we decided to look at alternatives and getting it carved, like many of the original trees done in the Woodfield area. We contacted Robbin Wenzoski, who we found on the internet. He has done most of those in London. We wanted something that was Canadian and to do with a wildlife. I have always been fascinated with Canadian big game animals, especially with moose. Robbin advised us that there was not enough material to do a complete body but suggested we consider moose head instead. He would carve it out of black walnut and fuse it to the top of my trunk stump. Needless to say, we were very pleased with the results and able to watch the progress on his face book page as he worked on it at his shop. What we were not expecting, as time went on, was the attention it attracted from passing motorists and pedestrians. Not a week went by that someone wasn’t stopping by or knocking on our door, asking for permission to take pictures and hear the story behind it. It rapidly became an icon on our street. The neighbourhood joke is that police, fire, ambulance and pizza deliverers are told how many doors east or west the address is from the moose head. on, including Hamilton Road. We could move it back to a Hamilton Road area location at a later date. About a year ago, the HRABA (Hamilton Road Area Business Assoc.) executive was searching for ways we could improve the Hamilton Road Area from an appearance and business standpoint. Other areas in the city, like downtown and old east, seemed to be getting all the interest and attention. As usual, east London, especially Hamilton Road, was getting left out completely. We needed to get on the same playing field as these other areas but, as a business association, this is almost impossible to do without an official designation as a BIA (Business Improvement Area) and/or Community Improvement Area. With the cash flow, property tax breaks, development incentives and small business grants and loans that go along with them, this had to be one of our long term goals. It goes without saying that you cannot proceed, in this direction, without the support of a majority of business in the area and this is difficult to achieve when, in the end, it involves increased business tax levies. As small as these levies might be, it is hard to gain a consensus on promises of what you plan to do alone. We realized our chances of success might improve, and our plan make more sense, if we could show the business community what we were doing. “Don’t show them what you are going to do…. Show them what you are doing!” But how could we achieve this? The source of cash is our membership dues and this year, with a modest increase, they sit at $100/year. With 60 paid members, it was obvious the cash flow is not there to do anything significant if we were not prepared to think outside the box, as they say. What can you do with $6,000? Our successful banner program that involved hanging colourful banners from Hydro poles was very popular, but that ate up almost $3,000/year out of this. If we could orchestrate getting some of these tree trunk carvings done along Hamilton Road, surely it would have the same effect for businesses on Hamilton Road as we had experienced with the moose head at my home. The problem is there were not that many big trees left. The locations of those that existed weren’t appropriate and waiting for them to become candidates might take a long, long time. These carvings are not cheap and so the cost became a factor once again. There really seemed to be too many obstacles but we looked into it anyway, as there seemed to be few alternatives. What followed was serendipity by definition. Tourism London: We met with John Winston, General Manager of Tourism London, to sell him on our idea and discovered an already existing and costed subsidy program established to promote London’s Tree Trunk Tour as a tourist attraction. Tourism London would offset one third of the cost of a carving and, very generously, STHIL Chainsaws another third. The cost problem was disappearing. Longevity: We met with some of the carvers regarding longevity of the sculptures. We were told that the only threat we had to worry about was the degradation of the wood. The portion above the ground, if maintained properly and stained regularly, would last forever. The vulnerable part, however, is the root system which, if not drained properly, will eventually start to rot and cause instability. The correct way to prevent this, we were told, was to cut the tree off at the ground, pour a concrete pedestal or foundation and dove-tail the trunk back down in place. A light went on. We didn’t have to have real trees. We could actually recycle old ones. Transplants: In a subsequent meeting with Tourism London, we were advised that some of these problems were already appearing with some of the carvings in the downtown area. One in particular was being cut down out of necessity because it was difficult to find someone to do the maintenance and there were insurance concerns with having anyone especially volunteers do it. The “London Tree Trunk Tour” link on Tourism London’s web site was now pointed to a location that no longer existed. I was asked if it would be ok to include my moose head on their web site. They asked me what I wanted to call it and I realized there was an opportunity here to scoop something that would be difficult to put a price on. 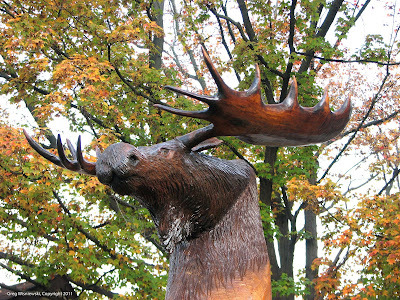 The Full Circle Group Benefit Moose Head was added to the Tree Trunk Tour. My business had its picture, name and address on the city of London web site as a tourist attraction, and we had another very important piece of the puzzle that would provide important leverage for our members. QR Codes: During these initial stages, we were approached by blogger Greg Wisniewski whose blog called Looking Around London highlights the art of tree trunk carving, the artists and details about the various sculptures around London. He had a great idea. He suggested we include QR Codes (Quick Response Codes) on our sculptures. With time, almost all pictures will be taken with smart phones and QR Codes will allow us to provide detailed information on the history, artist, kind of tree and wood, reasons for the carvings and links to the sponsoring business’s web site as well as GPS co ordinance and directions to the next sculpture in both directions. s and decided on both a design and carver. We liaised with the adjoining Baptist Church to ensure they would be on side. The first carving was done and an old dead tree was transformed into an amazing work of art. The sculpture stands in the place of the century old tree, one of the last elm trees in London and the first to be carved. The canopy covers the street on a Google streets picture from just a couple of years ago. We got our start. Public Locations: We approached the city regarding three prime Hamilton Road locations on city property. We met with Geomatics, the city’s survey department, to determine what we had to do from a survey, engineering and permit standpoint. We made presentations and got approvals from the U.C.C. (Utilities Coordination Committee) to get necessary permission from all the utilities, cable and telephone organizations who have priority access. The necessary surveys were done. Public School Connection: The three city owned locations are all adjacent to local public Schools. Our objective, with this project, was to involve the community as much as possible and it was impossible to resist the obvious geography and proximity to these public school locations. We approached the principals of Ealing, Trafalgar and Aberdeen Public schools and are receiving proposals from their students and/or graduation classes as far as themes, concepts, and names for their carvings. The drawings and ideas submitted have been amazing and we will be sending them off to our list of qualified carvers for tender. We anticipate they will put chain saw to wood, as they say, before the summer is over. Stone Pedistals: During the initial installation of our first sculptures, we connected with Tony Medeiros of Stone Paradise here in London. Tony offered to provide us with limestone slabs that not only provided the same structural support as the concrete footings but was much more asthetically pleasing, did not require underground locates, and actually cost us less money. The fit was obvious and we have used these slabs of every installation since including the Figure Skaters which have now been unveiled. ning stage, it became public that the city of London was planning on spending over 1 million dollars to enhance the appearance of down town London to accommodate the World Figure Skating Championships in March of 2013. It made sense to us for our association to contribute, all be it in a much smaller way. If we could do something that would help promote the Championships we might be able to leverage them at the same time, drawing attention to our Tree Trunk Tour. We believe Hamilton Road is the gateway to downtown London. A traffic count both ways on Highbury Ave. is well over 40,000/day, Wellington Rd just over 30,000/day and Hamilton Road 22,000/day. It would not take much to increase the east/west flow, especially if there was a good reason for taking that route. We came up with and idea to do one of our sculptures, on a much more significant level, with a figure skating theme. A life sized (it turned out to be much larger than that) figure skating couple might act as an icon for the World Figure Skating Championship and at the same time, if located in the right place; become the Las Vegas sign of the event, channeling more traffic down Hamilton Road. The Championship would be watched by hundreds of millions of people, all over the world, and networks from every country will be in London with lots of time to pay attention to local human interest stories. What better subject than this Figure Skating Couple, carved from a native Canadian black walnut hardwood tree and a two kilometer stretch of east London Street populated with wild life and animal tree trunk carvings. How many cities and how many streets in the world could make that claim? Tim Horton’s Sponsorship: We met with the owners of the our local Tim Horton’s in our area and, subsequently, with their district representatives. The London store owners were thrilled at the opportunity to get involved, at their local level, and sponsor this project. We began a search for the most appropriate location and, in the end. it was decided that a temporary downtown location, made possible by the new portability of the stone pedistals, would make the most sense for all of London. Dundas and Wellington Location: The current location, at the SE corner of Wellington Road and Dundas street made the most sense of all the locations available to us. Not only was it the closest location available to the Budweiser Centre and all the Figure Skating activities but it was also a very open and prominent spot as well. The location of three of the existing “Metal Trees” in a perfect triangle not only provide an appropriate frame for our Skaters but in a kind of symbiotic fashion, bring the old and the new and the artificial and the natural together, each with their own kind of artistic integrity and each with their own tour and multiple locations throughout the downtown and Hamilton Road area.